Every year I try to cover the E3 press conferences as much as I can. I usually cover the most important ones. 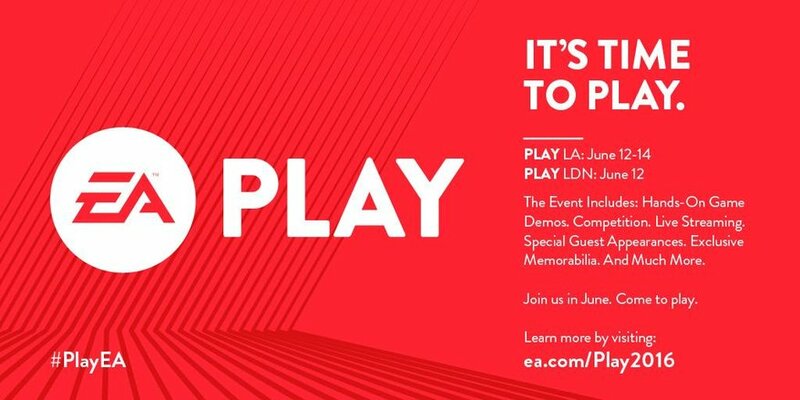 This year's E3 was kicked off by EA Play 2016's press conference. See the highlights below!!! So the big thing was that Titanfall 2 was also going to have a single player mode, something a lot of people were hoping for the first game. I dug that the Titan talks and is interactive with the player. We have been waiting a while since the controversial Mass Effect 3, so it is nice to see the franchise heading into new territory with new characters. The trailer definitely has me interested. Of all the titles that EA puts out, this is the one I really don't get too excited about. Now that is just me. I know this is one of their most popular and like every year it looks incredible. If you want to preorder the game, you can do so by clicking the link above. This version of FIFA has definitely gotten my attention. Follow a new player from his humble beginning to the biggest game in Football! I love that there is a story mode and you can really get immersed into the world! By far the most interesting and beautiful game on the list, although most indie games are. It is very well drawn and it was something that caught my attention immediately. I love these types of games, they are challenging and stunning! So there is a LOT coming in the Star Wars universe. You will need to watch the above trailer to see what is new in the SW Universe! And it all looks amazing!!! A lot of people fell in love with this trailer, and yes, I was one of them. There is a lot a new stuff coming in Battlefield 1, the biggest change, WWI! Trains, horses, planes, airships and just amazing destruction! Totally loved this and they had a competition this year you could watch. Check out the awesome trailer! All in all the EA press conference was good, but nothing that was super surprising. There were no drop open mouth moments, which kind of bugged me. And usually EA gives us a hour at least, their press conference today was about 45 mins total. Tell me what you think about the games and let me know which game you are looking forward to the most!